As the sun sets while waiting for the clouds to clear Mayon Volcano, the sky started to burst different Hues that blends to the color purple of the Lilies. It�s really worth waiting though I was sucked 5x by a 4 inches Leech and worried to be lost in the dark�. The photo was taken near an active volcano in the province of Albay, on the island of Luzon in the Philippines. For sure you are a good acquisition in this site. Your presentation seems very well done. Hello Chris and welcome,a very colourful first post. I like the trees silhouetted against the evening sky. Pretty fg flowers, are they a crop of some kind? P.S. The things that we do in the name of photography! Being bitten by leeches! Ugh!That's brave. 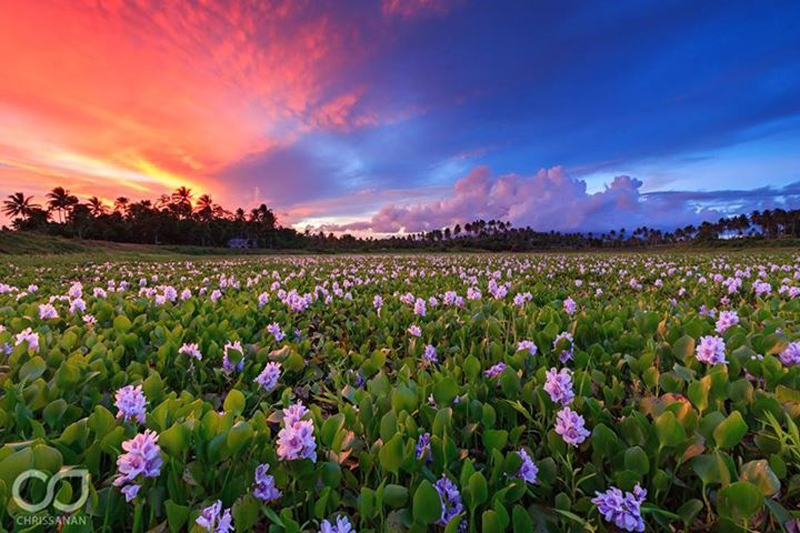 Amazing shades in the sky and attractive field of flowers. A very atractive mix of hues and a surreal effect over the lilies. Well worth the danger just to register the moment and better yet to be there as witness to such beauty. Welcome and keep them coming! Stunning colours that sweep across the sky. That is an amazing palette of color. May be the horizon should have been moved a bit up. Lovely shot.